I must admit I'm totally unfamiliar with the New Adventures of He-Man and any characters that were introduced therein, as I'd "grown out" of Masters of the Universe well and truly by the time it came on the scene. I know Optikk wasn't high on some people's lists, but I have to say that for a character I knew nothing about, he looked pretty groovy from the start, and since I'm a subscription holder and in the line for the long haul, I never thought of selling my sub Optikk off. One bizarre thing I encountered as soon as I opened the package was that I found that his "extra" eye, the orange one, was covered in some sort of oily substance. Maybe someone at the factory really, really liked the orange eye? I don't want to know, but I don't want that to happen again either. Bizarre oily substance aside, I was pleased with the amount of detail that was involved in putting Optikk together. Considering that this line is built around reusage of the same bucks, I do like the figures that make the most of the sculpting and detailing to make something really quite different. This eyeball chappy definitely falls into that category! Great stuff happening here with his armor and circuitry and this is supported by excellent paint application. He also has some very groovy weapons, and the brilliantly done swappable eyes top it off perfectly.. He might be more futuristic than most of his MOTUC counterparts, but unfortunately he still suffers from the loose ankles that plague the line. Seeing as he's a bit top heavy, this makes posing a tad difficult, and sadly that's a problem that can't be wiped away as easily as bizarre oils. Also out at the same time was the reissue of Mer-Man. Mer-Man is one of the characters I remember most from the original line, which isn't surprising since I'm always a fan of underwatery type characters. I really can't remember if I had the figure or just coveted it. Either way, next to Moss Man, this is the figure I'm happiest to have added to my collection. Like most of the characters that come with an two heads, Mer-Man came packaged with the head that I like the least, so we quickly swapped from moderately menacing to slightly goofy. I'm sure that doesn't say anything about me. The thing I like about Mer-Man (the goofy version) is that he's just plain hokey fun. Something like this fishy guy could only have been created in the 80's, but he's been given a suitable update here. His - and sorry for getting technical here - bodice-y thing - is very detailed and his trident is all kind of goodness. Once again - loose ankle syndrome plagues this otherwise excellent figure. Still, I'm very glad this fishy fellow got a re-release! Last but not least from the May MOTUC gang is the big guy, Tytus. I knew this fella was going to be huge, but I still wasn't prepared for just how big the box was, let alone the figure. He is truly huge! I'm extremely impressed with the sculpting on this figure - especially the muscle definition. The articulation is somewhat limited, which, according to Mattel was a cost concern. I'm all for keeping the price point as low as possible, and certainly don't see how the figure suffers in this instance, although I'm a displayer, not a player. Tytus comes with a groovy accessory, which I must say I don't fully understand. It's either a giant ice cream scoop, or something to trap and catch smaller foes. Either way, it's good fun, and despite it's weight the figure can hold it quite easily without impacting on its balance if placed at the right angle. 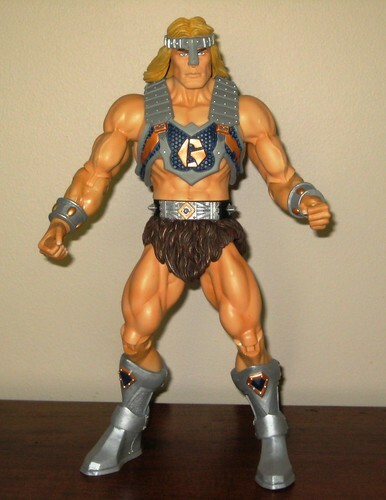 Tytus is the kind of product that makes the MOTUC line so much fun to collect. Taking a character that never saw a U.S. release like Tytus or a mail-away character like Wun-dar, so rare that some think he was just an urban legend, and making them a reality is the kind of stuff that toy collecting dreams are made of! All I can say is long may it continue! You can see more pics at Facebook, discuss this at the AFB Forum and comment on this post to enter the July AFB Comment of the Month Contest! Still not fond of tytus. Mer-man is one of the guys I really need to pick up, but my main excuse (having owned the original) doesn't apply to him. Optikk turned out sooooo well, I kinda shocked. Nifty stuff Andy! 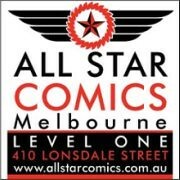 But where's the Tytus comparison pic with regular figs? I dunno, I think I'd only be picking and choosing if I got into this line, and I'd be more or less going for things I remember from being a kid. either way he looks nice. i'd like a floating eye, i'd scare my friends kids with it. 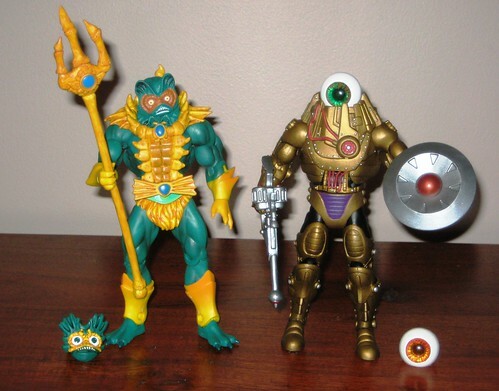 Mer-Man is still my favorite figure and my favorite MOTU character. Awesome fish guy! You definitely need to see this article about WhatsApp message spying.